It takes as much energy to wish as it does to plan. E.Roosevelt. Our goal at BERcerts.ie is to provide effective consultation and energy advice for commercial and residential properties for both new and existing customers. We provide professional independent advice for our clients on a various range of solutions including advice on renewable technologies. At BERcerts.ie, all our assessors are fully qualified SEAI registered energy assessors with many years experience. Here at BERcerts.ie we are not simply interested in energy ratings or indeed energy tests, we are here to provide the highest levels of service at ensuring your building complies in all the necessary areas of building energy compliance. We provide BER certs and help with Part L compliance. Under revised sound regulations which came into force in July 2015, sound testing is now mandatory on attached dwellings. A sound test can be carried out by a SITRI Registered Tester. The BERcerts.ie team are SITRI Registered Testers. We can provide expert advice to both builders and homeowners on how to reduce and eliminate sound leakage. So call now to arrange a consultation and avail of our proficient sound testing service. Under revised building regulations which came into force in Dec 2011, air tightness testing is mandatory for all new dwellings. The aim of the testing is to reduce energy losses from the dwelling in the form of air leakage. An initial air tightness test as soon as the airtight layer is fully installed allows builders to locate possible air leakage points. Air tightness tests help comply with Part L compliance. These tests are sometimes called Blow Door tests ( although we do consider this somewhat dramatic) or Blower door testing. 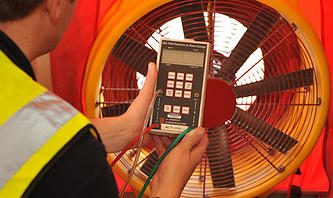 Air tests are critical in identifying the air pressure rate and so are imperative in Air compliance to the regulations.